Lyle Ronglien >> Beginning Guitar I - The Very Beginning >> Tuning and Your StringsFinger Stretching - Reading TABStrumming Your First ChordsPlaying Your First MelodyPlaying Your First Song! Lyle: This is the lowest and heaviest sounding chords you can play on the guitar. It uses all 6 strings. Use your 1st, 2nd, and 3rd fingers for this chord. Can you get all 6 strings to ring clearly? Push down firmly and make sure your fingers are out of the way of the surrounding strings. Michelle: I'm thinking I'm not going to be able to pull this one off unless I cut my nails? Lyle: Yes, long finger nails always get in the way of pressing down on the strings. You're going to have to cut them on your fretting hand. Lyle: This E chord is a major chord, not a minor chord. 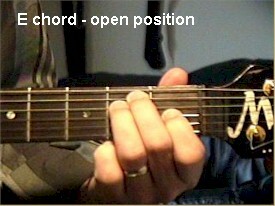 It is also called an "open position" chord because it's played on the lower frets and there are open strings involved. wing5wong: So that's what open chord means...? Lyle: You can also strum the open position E chord along to the jam track. Now you have two things you can do with the looping jam track, 1. strum the open E chord, 2. play the E major scale with it. Lyle: This is a melody from a very popular song around my house. Lyle: Here's what all 4 melody parts look and sound like when put all together. Your goal is to play this right along with me or the jam track. Alkatrrrs: What do the numbers on top of the regular notes mean? Support: They are just bar number in case the teacher wants you to refer to one. Lyle: On all of this lesson, the chord, the scale, and the melody, use a down stroke with your pick. Lyle: It's very important to practice playing along to the jam track so you'll get good at staying right with the beat.